This package contains Brassington, Essentials Of Marketing 3e and access to MyMarketingLab. Important information for students:You need both an access code and a course ID to access MyMarketingLab. Ask your lecturer before purchasing a MyLab product as you will need a course ID from them before you can gain access to the system. 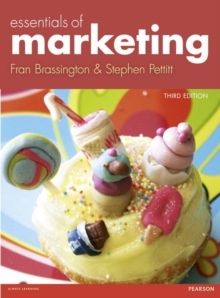 The eagerly awaited third edition of Brassington and Petitt's innovative and creative Essentials of Marketing is a concise, no-nonsense book, designed to contain all the essential information that students need to understand when taking a short introductory course. Like Principles of Marketing, this essentials text brings together theory and practice. It covers a wide range of applications, industries and markets, exploring the way marketers must respond to those situations that demand an innovative response MyLab and Mastering from Pearson improve results for students and educators. Used by over ten million students, they effectively engage learners at every stage. MyMarketingLab is a personalised online study and assessment system, which tailors to the unique learning needs of each student. Offering unlimited opportunities for practice and providing relevant and timely feedback, it helps students master key concepts, experience more "I Get It" moments and ultimately achieve better results. For students * Interactive Mini-Simulations and quizzes - Interactive Mini-Simulations and quizzes place students in a realistic marketing situation, challenging them to make decisions based on marketing concepts and see the impact of the decisions they chose. * Self-Study Tools - Multiple learning aids, such as videos, flashcards, and audio study guides can provide your students with the practice they need to master the material. * Self-Assessment - MyMarketingLab offers robust self-assessment tests to determine mastery of key content areas. Organized by major section or chapter, these diagnostic tests contain questions that are mapped to the Learning Objectives within the text. This varied assessment program enables students to accurately measure student progress. For educators* Online Assignments, Tests, Quizzes - create homework assignments, quizzes, or tests, and add them to your MyMarketingLab course. Questions can be used from the test bank or you can even upload your own questions. * Instructor Support Material. A wealth of instructor support material simplifies and enriches the teaching experience. MyMarketingLab gives you access to text-specific materials including instructor's manuals, test banks, and PowerPoint (R) presentations. * Customized Feedback - Since MyMarketingLab calculates and reports test results automatically, instructors can closely monitor student and class progress without investing any additional time. * For educator access, contact your Pearson Account Manager. To find out who your Account Manager is, visit www.pearsoned.co.uk/replocator This package includes MyMarketingLab, an online homework, tutorial, and assessment system designed with a single purpose in mind; to improve the results of all higher education students, one student at a time. With a wide range of interactive, engaging, and assignable activities, students are encouraged to actively learn and retain tough course concepts.